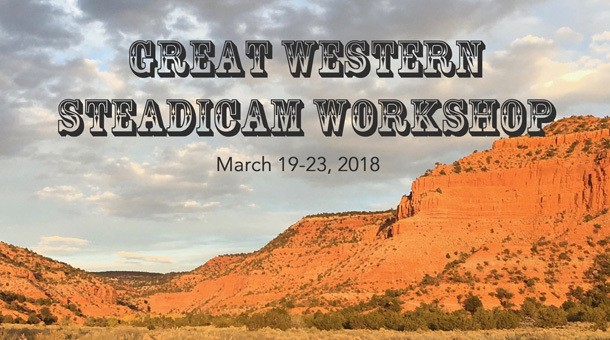 After many inquiries following the Steadicam workshop held in 2015, I’m excited to announce that the 2018 Great Western Steadicam Workshop is now open for enrollment. This is an intensive workshop that is intended to establish all the traditional skills that a beginner will need. Steadicam Operating is a delicate balance of aesthetic, muscle training, balance and style. It is mentally and technically demanding and it’s imperative to learn the required skills from the first day of instruction. Our instructors come with decades of experience, having shot the biggest and most demanding film productions of the day. The curriculum is intense and is designed to equip our students with the most solid foundation as they pursue their future careers as a Steadicam Operator. During the 5 day workshop we will help you build skills that, as an established operator, you will constantly refer back to. You will leave with the tools to practice and develop once the workshop is over. You will also build a camaraderie with fellow operators, coming away from the experience as a part of a new generation of Steadicam Operators. These bonds will be an enduring resource as your careers develop. The workshop is limited to 24 students and our base location will be at Paramount ranch, near Los Angeles. We will provide top of the line equipment and the camera packages will vary depending on a particular lesson. The course outline is as follows, not necessarily in order as we cycle through topics while concentrating on particular skills..
– The Physics of Steadicam. – The Perfect Setup, and Does It Exist. – The Physics of the Operator. – Feeling the Force and How to Lead. – Design and Visualization – A Structured Approach. – How to Survive on Set. – How to Practice without scaring the cat. – All modes from Ultra-High to Uber-Low. – Hard Mounts, Vehicle Mounts and Cranes. – Our 3D World at Warp Speed. – New technologies and the big step backwards. – The Evolution Of Accessories and How To Customize. – The Business Side Of Steadicam. The price for the 5 day workshop is $ 3500.00, which includes breakfast, lunch and a special farewell BBQ on the final day. All necessary equipment is included. A deposit of $1000.00 is required in order to reserve your space. ​For additional Information, please take a look at the DETAILS page.